The short, round, mound of sound, from up top, down under, with a comment on anything and everything. Start up??? Too many people go to a trade show or convention and hear someone say that this machine will make you a millionare. I hate to hear stories of people investing their all their savings and buying a franchise or a tm whatever and guess what. They go broke. I started part time, didn't give uop my day job right away, but to each their ow. Someone has to have aa solid income when you are getting started, wife, night job what ever. I started with an old used Deep Steam Machine, than the Steam Valet R2D2 and than onto a tm. What some don't seem to understand that in some cases like mine it took years to accumulate all my debt and collection of junk. I didn't just do it overnight. I guess what I am trying to say is start small, think big. honesty, good reliable service, good communication, follow ups. and all the posts above. very good point mr steamer. You hit the nail right on the head. Yes it takes money to start, run and grow a business. So this is why so many fail. After I take approximately $2,500 in selling a newbie a carpet cleaning machine they generally don't have enough left over to buy a cheap pre-sprayer. It's a good thing I throw in the chemical or they couldn't afford to do the first job. Yes, money is the stumbling block. Money makes the cleaning go round..... I think at least 15 thousand working capital is need... this is after chemicals and equipment has been purchased. Over the last 31 years I have started and run four business's. First in San Diego area, then Dallas, then Wisconsin and now in Lexington, Ky. So many DO make the mistake of counting chickens before they hatch, it takes WORK people, plenty of work, but one thing I do that has worked the BEST for me over the years is: When you are being paid and the customer is raving about your work, THAT is the time to hand them three small brochures about your company, ASK them to tell thier freinds and family, TELL THEM you want to grow your business. So many people just talk and don't ASK or give them a tool to HELP you, if you do great work they WANT to help you. WE give $10.00 referral cards redeemable at the time of cleaning for EACH customer they have referred us to. USUALLY they THROW the 10 dollar cards away... WHY???????? Because they say telling thier freinds about our cleaning makes THEM look good. As much as I am for doing the BEST job, that is second in importance to how you HANDLE customers. What do you do to make them remember you? Just the cleaning? Humm, works sometimes but more often it will be something you SAY or discuss with them that will make them remember you. The other day Bri, my daughter was cleaning for a old fart biker with a big belly and a gray beard. HE grumpily asked her is she was any good at cleaning and IF she could handle the job. She looked him in the eye and said, "I can probably handle this machine and cleaning job BETTER than you handle your Harley." He belted out a big laugh and told her, he would NEVER forget that. ANother time a customer stood their watching every move, Bri spun the handle around of the Conqueror and told her, if you are going to watch you might as well learn...LOL the lady loved it, again she will NEVER forget her. Love your customers, remember THEY are your reason for success. Your attitude should be more like you are going to see a freind than a client. Many deny this, but it has worked very weill for us over the decades and also for those who worked with us and then went on to run their own businesses. Great info up above, great thread! Mr. Steamer: You have to learn how to walk before you run. It is hard to start at the top and stay there. One has to realize their expections with regard to results. It takes time sometimes longer than some want to wait, regardless of how much money they have behind them. With the right funding and the proper Marketing ploy along with all the good service tips, sure sounds like a money maker to me. I think it's hard to start from cold turkey... you have to work for someone to gain enough experience. We have started 100's of companies from ground zero, we sold them a system and 95% have then have succeeded. Realistic expectations plays a major role in success as well. Most of these people NEVER owned their own business before, they were carpenters, dairymen, lawyers, airline workers, school teachers, principles etc. This is not a quick rich scheme. Move to a big city of at least 5 million people, then you can not fail. Spend your money on adverstsing. Staying a one-man-show with maybe a helper will make you a good living. But the years go by the body starts to fail and you are worn right out. Now you say I have built up this business over 35 years and I will sell it. Guess what? It's worth nothing unless you go with it. This is not new as it has been posted before. 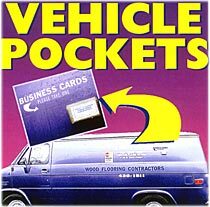 But I think that Vehicle Pockets is one of the best ways to promote your business. Dollar for dollar it is absolutely the best value. Your van is parked most of the day infront of customers homes for other neighbours to see. Why not have them take a business card from your Vehicle Pockets? I have customes who have actually had people flag them down for a business card. I can recall a day when we made more a sq. ft. here in Canada for carpet cleaning than in the US. What to hell happened? "American believe in paying for service... Canadians want them for free"
last CC co. I worked for we were charging .30 sq.ft. and I know he's raised his prices since then. I think it is how and who you market your services to. I have only been on my own since Dec. 2002 and other than a smaller YP ad I have done 0 advertising this year and I can hardly keep up to all the work. If your 15mins late... they want it free.... Had one Lady demand that we pay her for her day off (500 bucks) and clean the carpet free..
Mr. Steamer: You are right about Sears in the US. I usually collect their brochures when ever we go over. Puting what they get into canadian money and I might even be happy with what they charge. I may not be in the GTA, but we do have one thing in common. People who want things for nothing. My horse and I can get pissed off real easy somedays. What does a big company have over you??? Lots of them only have a few employees and the rest are subs.....anyone can do that..
For extra Money Techs do door hangers up and down the street they are on..
Mr. Steamer: I talked to a carpet cleaner who was cleaning at the place where we stay in florida. I have talked to a couple of different cleaners each year we go. You think GTA is cut throat, it has nothing on Florida. But I like the heat so I would go there. After all I think there is thousands people a day moving into Florida. But we stay in Kississmme a few minutes from everything and a little slower pace. I think the hard part would be having no real season change. So will the humidity. And if that doesn't, the hurricanes get a shot at you every few years. Never meant to belittle Steamer with my "that's a crock" response. but it was in response that ONLY Americans will pay for good service....which I still believe to be untrue. Steamer you can build a successful business without mass advertising and spending tens of thousands. Yes advertising is important but not the be all and end all. If you have deep pockets and name recognition like Sears then you can throw tons on money into Valpack advertising. It seems to attract the lowest common denominator if you ask me. I have used this form of advertising before. The name of the game is referalls and by getting on the phone and exhausting your warm market, your business will build steadily. For example, success can be achieved by aligning yourself with a company that already has a database of customers and offering a complimentary service and a small percentage. By focussing on a niche market and refusing to get down in the trenches with the bargain hunters, your life will be easier. And if you ever choose to expand beyond a one man show then the margins are there to pay someone so they remain happy and loyal. Grout cleaning can be lucrative. It pays much more than carpet cleaning and in my opinion is usually easier. Niche niche niche... thats all I can here...who or where is this niche market. I can tell you right now in the GTA... there are customers out there that don't know who to call... the don't know the GMONEYS... they don't know the Splash n Dashes... they only know the Co. with the big ad. Starting a business from the ground... you have no customers so where are the referrals going to come from...???? how are you going to get the exposure you need??? You can only get referrals if you have customers. you can only get customers if you advertise...For the part time or weekend cleaner referrals are great but for those that need the calls to put gas in the tank and food on the table you have to think bigger. Mr. Steamer: Very good responce. Living in a smaller market people startup everyday. People jump ship and try them. "new broom sweeps cleaner" they say. But for how long? I think in some cases you are only as good till a cheaper price comes along. Loyalty is not like it was 10 or 15 yasr ago. Things have changed. I have had calls asking if it was my company was coming to do their cleaning as they could not remember who the called? I stated we have done your cleaning in the past. Their responce" someone in the office used this company and they did a good job and they are cheap. No sence going on as I will have to listen to the cleaners who will say their clients would kill their first born rather than call another carpet cleaner. Customers will try another cleaner even if your good... they will try a few then most times come back to you... people are always looking for better and cheaper.... That includes me, I guess it's a part of human nature.. If they don't try anyone else how will they know your good??? To keep a customer you actually have to love them... they need to feel that you love them and will do everything in your power to do a phenomenal job. I believe you have to be professional, yet sensitive, you have to be able to anticipate , you have to be able to read body language and facial expressions. and trust me every customer wants to feel special..... you have to convey to them that you want to clean their dirty carpet and do it with a smile.. If you are not getting loyalty maybe you need to CHANGE something, we live by the loyalty of our customers, always have. Referrals are from MUCH more than just clean carpet, how do you interact with your customers? How do you set yourself apart? WHY should they call you again and again... I know why my customers do, now you have to give YOUR customers a reason too. Last year I got off the truck and my daughter took over, she hasn't lost any customers either, you need to do and say something that helps them remember you forever. Interaction and knowledge and friendliness all are a part. John: My son has almost taken over. The good thing after awhile people just call and ask for him. That never happened when I had someone else on the truck. I had the same man for over 5 years on one truck and still I was the one called. So I think a family member is a different comparson than a stranger. Mr. Steamer: It is true there is no comparison. I don't think it is FAMILY as much as it is PERSONALITY and desire. My daughter desires to treat customers well, do a great job and create an even larger business for HERSELF. Truth, truth, truth, I totally agree Mr. S.
People want to deal with the Boss/Owner, they always do. They think the Boss is likely to cut a better deal or knows more (even if that is not the case). Put youself in that situation. You go to buy a car. The salesman is forever running to the managers office or to the Boss. You might as well be dealing directley with the Boss. The son taking over the business, he is too going to be the Boss. He is already the Bosses so/daughter. I'm just wondering... How does the independant Cleaner deal with their big name competition???? WE don't CUT ANY deals, 30 cents a square PERIOD! Well all I can tell you is "IF" what you guys are telling me is true, then WE really do have a much larger benefit than even I thought we did. People don't even bother ASKING for deals, the DEAL is clean carpet. The key to building a business can start from a number of angles. What types of business image, example small family business image, corporate image . This will decide what avenue of marketing!!!! Word of mouth, PR with your existing customers, type of advertisement direction , live demonstrations at malls with entry mats or carpet spotters , home and garden shows . Its requires effort and time not necessary allot of money. I started in 1982 , very small carpet cleaning business. Its took me 6 years to make it a very stable and profitable company. It seem to take you a direction of deciding what market share do you want, the low end clients or the mid to high end clients . Do I what to work more jobs a day for a certain $ amount or work few jobs the same $ amount. Every one has an view what a successful company is and that view will not be the same for every one. My view is keep it simple and have fun doing it! In my small area we cleanem all. Mr. Steamer: WE do because we have to. Like it or not. it must be busy to be able to run 2 405's up in your one horse town??? Not if they are pulled by the same horse Mr. Steamer. Mr. Steamer: I woudn't want ot over work them. Free rooms are a good thing if directed to high income households and you charge premium rates so that you make good money on additional work done. Hey Kenny do you have any sample ads??? Joe Polish has many ideas like this that work, and if applied right they work well. My scanner is busted, so I have none to show you. Ken....I'm VERY suprised YOU don't have the BEST and CHEAPEST marketing package out there.....dude, you are slipping!!! I bet it's one of the millions of ideas you are bringing to the market in the next 12 nanoseconds. You are the copy king, so use jOey's stuf as a template. I can just imagine your version of a booty camp, complete with a giveaway of one of the '70's clunkers in front of your house...I bet your neighbors would appreciate that!!! P.S. OIL and GOLD are DOWN today!! Chuck, you need to get a life. Your constant fixation of me is getting old not only to me, but alot of other readers on this board as well. There is lots to talk about besides what I might or might not do. I haven't seen a post from the winner of the wand.....Kenada mail lost it yet??? Scott will have his wand on Monday. He will post about getting it after that. UPS air delivery. Mr. Steamer, what can I say; I am a guy that likes cutting it close. Playing it safe is not my style. Besides, if UPS is late I get my $100 for shipping back and the wand got delivered for free. I can hear the cries of"Grab your Torch and Pitchforks"
Niether rain, nor sleet nor hail will stop tha wand. it will if the wand never existed..... what will happen to kenny if there is no wand??? If it was late due to some unforeseen delay, it would only be by a day at most. Scott would be okay with that. He would know that it was UPS, not me. It took me a while to make the SHO glide for that wand after I recovered from the pneumonia I had until this week. This is the first week I have felt well since KK day 2 months back. The SHO glides are custom made one at a time for the KH3 wands and the Prochem titanium wands out of a special Teflon mix of glass and Titanium to impart added durability.